I feel like I need a disclaimer here. Friends? This dish? It’s not that good for you. And I’m sharing it anyway because you know what? Sometimes I eat unhealthy meals. GASP! CALL THE PRESSES!! GROUND-BREAKING NEWS! Sense a little sarcasm in that last paragraph? 🙂 I’m only kidding, kind of. I made this amazing dish for work and it was too good NOT to share, you know? 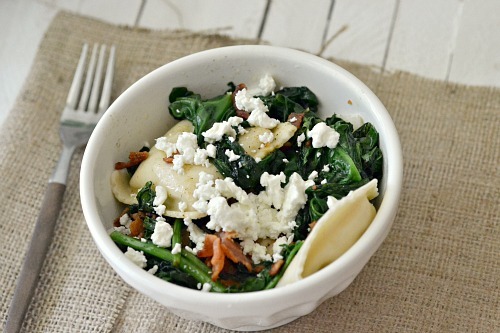 Which is no surprise because it has ravioli, bacon, goat cheese and wilted spinach. Oh, and the wilted spinach was cooked in bacon grease. Bahhah! 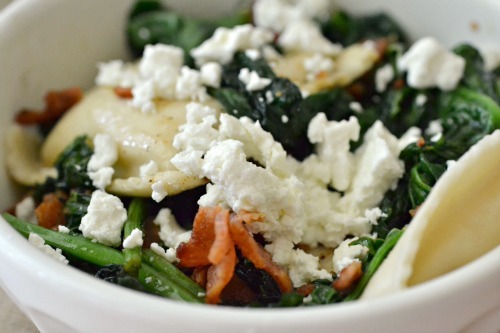 This dish won’t make you skinny, but it’ll make you happy. I mean really. 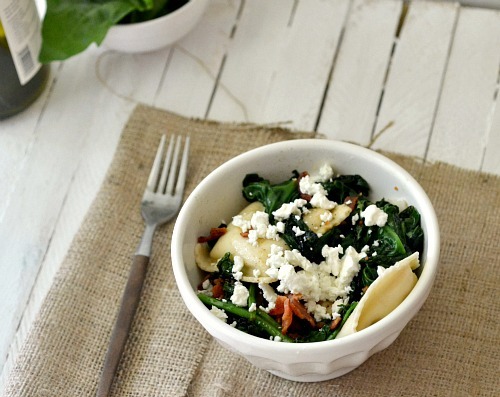 Can you get any better than cheese filled pasta shells, paired with crispy bacon, goat cheese and BACON SOAKED SPINACH? If I could eat one thing for the rest of my life it would be spinach wilted in bacon grease. 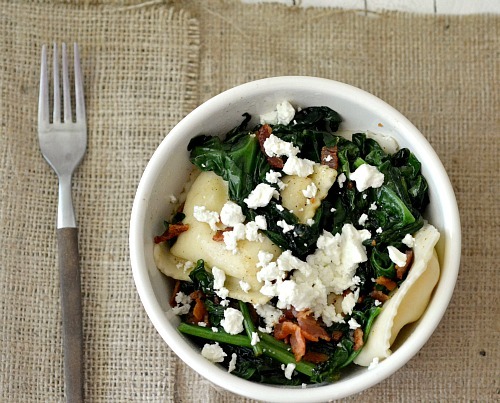 This is the PERFECT meal if you’re having a bad day and you just want some bacon comfort food. Or, if you’re having a great day and just want some goat cheese. Or if your day is indifferent and you want to perk it up. I mean, you could make regardless of your mood and your day would end up happy. Like reading rainbows, puppies, butterflies everywhere kind of happy. Which is exactly why I’m sharing it. It may not be skinny, but damn it’s good. CLICK HERE FOR THE DELICIOUS RECIPE!! Well that doesn't look good at all. hahaha! Yeah, it's not exactly diet friendly, but oh so worth it. you can't eat healthy/skinny every meal - sometimes you just gotta splurge! this is absolutely my type of meal. delicious! I know, right? I feel bad too which is ridiculous. 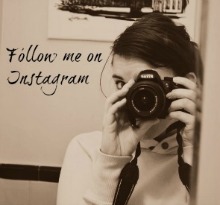 I KNOW. I'm like so into goat cheese recently! OH my GOD. I need a ravioli in my life right now. With bacon and goat cheese. Who cares about skinny when you have a dish like this! Sounds and looks amazing! Must check the recipe out!! Yum, Claire! This looks amazing! Oh this dish would definitely make me happy!